I found the Fawcett School section a few weeks ago and was prompted to look back in my archives as I knew I had a couple of photos. Indeed I did. 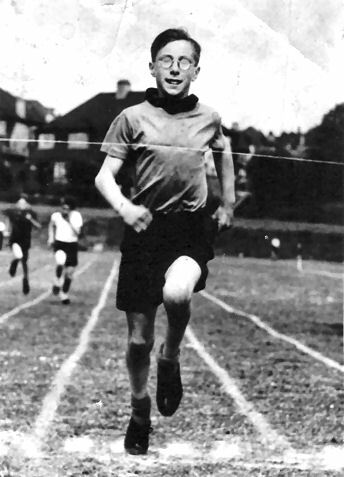 This is photo of me aged 13 running the final leg of the 4×100 yds at Loder Road and winning for Russell House. This photo appeared in the Evening Argus. Any more of my fellow athletes out there who can remember these sports events? If you can, please leave a comment below. I remember you Terry – we used to play football together with David Gunstone, Colin Wilkinson and a few others. Wish I could still play now. Just to say I was captain of Russell House in 1951-2. My most amusing memory was going up to receive the Mathematics Cup for the house one assembly, given that I was thrown out of the Maths class by Mr Fordham and did not take the subject in GCEs!